Long before aliens and unusual sci-fi creatures were realised with pixels and processors, characters like Star Wars' Jabba the Hutt were brought to life by a team of talented puppeteers, who, when hidden away inside the giant figure, didn't always know exactly where the puppet's hands were. CNN's Great Big Story recently sat down with Dave Barclay, who was the assistant puppeteer to Frank Oz on Star Wars: The Empire Strikes Back, helping to animate Yoda's expressive eyes and ears. He later went on to serve as one of the puppeteers inside Jabba the Hutt, controlling the creature's mouth and right arm. 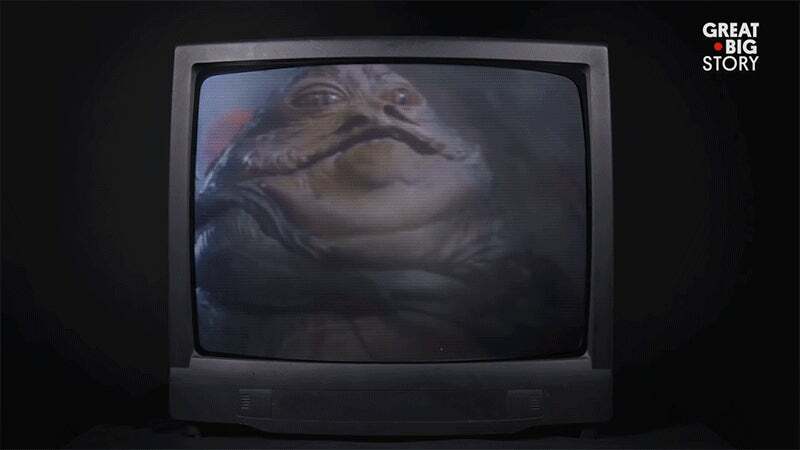 At one point during filming Barclay was instructed to have Jabba rest his hand on Carrie Fisher's shoulder, but because his visibility was limited to a live video feed on a small TV inside the puppet, the Hutt unfortunately and awkwardly, overshot his mark.